The International Healthcare Tourism Congress 2016 is going to be launched on March 18, at The Lalit Ashok Bangalore, Bengaluru, Karnataka. U.T Khader, Hon. Minister for Health & Family Welfare, Government of Karnataka will give the inaugural address while Dr. C. N. Manjunath, Director, Sri Jayadeva Institute of Cardiovascular Science & Research will give the keynote address. The two day long event will conclude on March 19. On Day 1, there will be seminars on telemedicine, infrastructure and economics of healthcare tourism, oncology followed by buyers and sellers meetings. Day 2 will witness seminars on dentistry & opthalmology, Ayush & wellness, organ transplant, destination marketing, and geriatric medicine. ITB China will take place as a new offshoot of ITB in the city of Shanghai from May 10-12, 2017, according to a release. The world’s leading travel trade show will provide China’s fast-growing travel market with its own platform, which is the combined product of strong partners. The corresponding agreements were signed on March 9, day one of ITB Berlin. The show will reportedly be organised by a new subsidiary of Messe Berlin, MB Exhibitions (Shanghai), and will focus exclusively on Chinese buyers meeting global destinations and service providers. VisitBritain opened doors to its annual flagship event ExploreGB. Being held in Liverpool this year, the event providing 300 British & Irish tourism suppliers and destinations with an invaluable opportunity to meet and do business with up to 320 hosted international travel buyers from 40 countries. This two day event will be followed by 15 different familiarisation trips making the most exploring great Britain. A delegation of over 20 Indian buyers is also part of the event this year. OTM 2016 was inaugurated by Thailand’s Tourism Minister Kobkarn Wattanavrangkul, along with Satish Soni, Director of Tourism, Government of Maharashtra and Joint Managing Director of Maharashtra Tourism Development Corporation (MTDC) in the presence of other global leaders of the travel fraternity. Neil Llanes from the Philippines stole the show at the inauguration with his beat boxing. OTM is being held at Bombay Exhibition Centre, NSE Complex, Goregaon (E) from February 18 to 20, 2016. It is a three-day B2B trade show, where more than a thousand sellers from 50 participating destinations will meet 6,000 buyers on the exhibition floor. Side by side the trade exhibition, there are a host of innovative events to discuss emerging trends in the travel business, such as TechForum@OTM, #StartupKnockDown and Shoot at Site@OTMsessions. These have been planned alongside OTM to specifically address topical agendas that are increasingly catching the industry’s attention. The UAE is leading their participation with all its 7 Emirates, making them the largest destination exhibitor in OTM 2016. They are joined by several global destinations at OTM 2016 with the keenness to carve a piece of India’s projected 50 million outbound pie – Philippines, Indonesia, Turkey, Sri Lanka, Mauritius, Thailand, New Zealand, China, Japan, Hong Kong, Macao, Bangladesh, Maldives, Oman, Bhutan, Seychelles, Israel, Rwanda, Romania, Fiji and Greece are all in place at India’s biggest travel show. The maiden Bengal Travel Mart 2016 (BTM 2016) will be organised from February 26-28, 2016, at Hotel Mainak in Siliguri. It will be jointly organised by the Department of Tourism, Government of West Bengal with North Bengal Development Department (NBDD) and Eastern Himalaya Travel & Tour Operators’ Association (EHTTOA). A total of 100 buyers and 80 suppliers are expected to attend the three-day exhibition. Surajit Bose, Joint Director, West Bengal Tourism, has reportedly revealed that BTM 2016 will comprise exhibition of travel and tourism products, B2B meetings, panel discussions, and cultural events. While the first day will only see B2B engagements, general public will be allowed on the second and third day. BIT 2016 Milan opened its doors to thousands of tourism experts, along with over 80 Indian Hosted Buyers reinstating the importance of the Indian outbound traveller. Business to India is also on the rise with 20 exhibitors from the country showcasing their products at the Fair from Feb 11-13. During the inaguration of India pavillion, Air India announced that it will fly four flights a week to Milan starting this summer. BIT 2016, Italy’s number one international tourism event, held at the heart of Fiera Milano Fairs hosted over 100 nations on five continents which participated at the Fair to promote themselves and showcase a host of new developments and experiences people can try out for themselves. South Asian Travel and Tourism Exhibition (SATTE) 2017 will be held from February 15-17. The dates for the next year’s event were announced at the SATTE 2016, being held at Pragati Maidan, New Delhi from Jan 29-31. The event is one of the biggest travel and tourism platforms showcasing India’s tourism potential to the world by bringing the global tourism market to India. 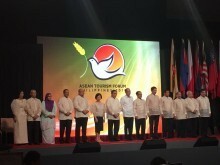 ASEAN Tourism Forum (ATF) will be held from January 16-20 next year. “Singapore is honoured to host the next ASEAN Tourism Forum (ATF) in 2017 with the theme – ‘Shaping our Tourism Journey Together’. This theme speaks to the importance of continual, collective efforts by ASEAN members to address challenges and opportunities as we jointly develop and grow the tourism industry in the region,” says Lionel Yeo, Chief Executive, Singapore Tourism Board. To commemorate its 50th anniversary, ASEAN will also launch a year-long travel campaign to promote the region’s diverse offerings. Within the ASEAN Economic Community, Tourism is one of the priority sectors for integration by 2015, and to achieve this, ASEAN had adopted the ASEAN Tourism Strategic Plan 2011-2015. ASEAN will further build on this momentum and develop the ASEAN Tourism Strategic Plan (ATSP) 2016-2025. “This will strategically transform our region into a competitive, sustainable, and more socio-economically inclusive and integrated tourism destination,” Yeo remarks. TRAVEX, a key component of ATF where sellers from ASEAN get to meet buyers from all over the world, will be held in Singapore from January 18-20, 2017.